The MER UK Awards, part of the Oil & Gas UK Awards, recognise innovative and sustainable ways to maximise economic recovery from the UK Continental Shelf. In January, this year (2018) Shell announced final investment decision on the development of the Penguins oil and gas field in the UK Northern North Sea (NNS). The project comprises the construction of a floating production, storage and offloading (FPSO) vessel, the first new manned installation for Shell in the NNS in thirty years. It is an example of making a positive contribution to MER by unlocking new opportunities in a mature field. This was enabled by innovative thinking resulting in lower development costs which support a world class investment case. The Project Team were faced with several choices that would make-or-break the competitiveness of the redevelopment and had to challenge conventional ways of working, employ innovation and embrace collaboration. In August 2017, a unique and innovative infrastructure partnership was conceived to enable the development of the Tolmount field in the Southern North Sea. As one of the largest undeveloped gas fields in the North Sea, the development of Tolmount is critical to maximising economic recovery in the UKCS. The development plan aims to deliver gas to the UK by the end of 2020. This innovation provided a win-win outcome for all stakeholders. Located at St. Fergus are 3 gas plants which process wet gas for a significant proportion of NNS/CNS oil and gas fields. From these plants, NGLs are exported downstream via two systems, SEGAL or FPS. The Shell-operated gas plant forms part of the SEGAL system and exports NGLs via SEGAL only. However, NGLs from the SAGE and NSMP gas plants can be exported via either SEGAL or FPS. Consequently, simultaneous outages of SEGAL and FPS could potentially have a significant impact on uptime of the SAGE and NSMP plants and disrupt production from oil and gas fields on the UKCS (and offshore Norway). A transformational technology which could significantly reduce well decommissioning costs has emerged recently. The technique uses an exothermic chemical reaction generated using thermite, to meld the well bore components and the surrounding formation to recreate the cap rock and establish a permanent barrier. Initially there was little enthusiasm among the operators to be the first to conduct a field trial, but the process was tested in Canada. Further trials helped technologists to improve the method. Prospective users sought ways to accelerate the product development. However the service company supplier was reluctant to take the lead. 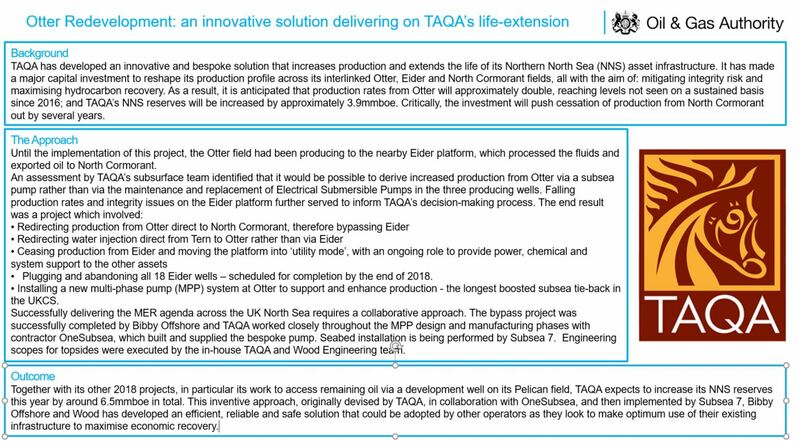 TAQA has developed an innovative and bespoke solution that increases production and extends the life of its Northern North Sea (NNS) asset infrastructure. It has made a major capital investment to reshape its production profile across its interlinked Otter, Eider and North Cormorant fields, all with the aim of: mitigating integrity risk and maximising hydrocarbon recovery. As a result, it is anticipated that production rates from Otter will approximately double, reaching levels not seen on a sustained basis since 2016; and TAQA’s NNS reserves will be increased by approximately 3.9mmboe. Critically, the investment will push cessation of production from North Cormorant out by several years. 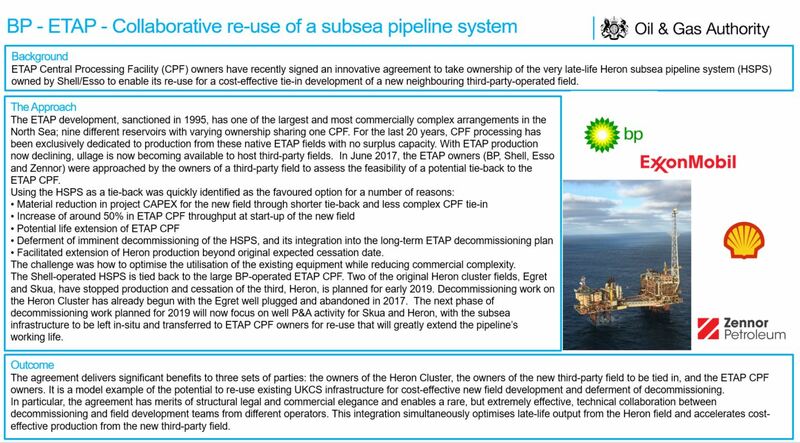 ETAP Central Processing Facility (CPF) owners have recently signed an innovative agreement to take ownership of the very late-life Heron subsea pipeline system (HSPS) owned by Shell/Esso to enable its re-use for a cost-effective tie-in development of a new neighbouring third-party-operated field. The 2017 award winners were announced at The Oil & Gas UK Awards, at the Aberdeen Exhibition and Conference Centre on Thursday 2nd November 2017. OGA Chief Executive Andy Samuel said: “We are seeing some great improvements in working practices across the sector – reflected in the high standard of the 14 nominations. I hope these diverse examples will inspire others to emulate such excellent practices and new ways of working." A video of all the finalists. The Callater project achieved first oil in May 2017 only 23 months after discovery, five weeks ahead of the field development schedule, more than 10%under budget, and with an outstanding safety record. This performance was realised through effective collaboration between Apache, Shell, the regulatory bodies and the UKCS supply chain. The partners worked together through geological evaluations, technical shadowing and by sharing technology. The regulators fast tracked approvals and the supply chain were engaged early in the project to help formulate specifications, provide pace and innovation. The Callater project is a repeatable, transferable and sustainable example of delivery with collaboration at its core. A video of the Calleater field entry. In an excellent example of collaboration and innovation Total E&P UK Limited has worked with the Oil and Gas Technology Centre to deliver a series of field trials for new technologies on its Elgin Franklin platform. These technologies relate to two priority asset integrity themes: process vessel inspection and corrosion under insulation. After factoring in the cost of deployment, it is estimated that between now and 2025 these technologies could deliver an industry net economic benefit estimated in the region of £700 million and will significantly contribute to MER UK. A video of the AI Solution Centre entry. In 2016 a group of industry commercial and legal leaders stepped up to transform the approach to commercial interactions. In less than six months the Commercial Behaviours Work Group led the development of a new commercial code of practice, a standard “study” agreement to speedup evaluation of new field development options and negotiation best practice guidelines; activity that would previously have taken several years. This new approach to developing and implementing the commercial tools required to aid delivery of MER UK has led to the formation of an Oil & Gas UK facilitated, industry-wide “Commercial Managers Forum” which focuses on sustaining and achieving cultural change. A video of the Commercial Behaviours Work Group entry. BP and Baker Hughes, a GE company (BHGE), developed an innovative commercial framework for the Bruce field. BHGE funded upfront costs by using existing equipment to design, plan and execute a well stimulation programme. In return, BHGE receive payback of their costs and a success-based margin based on the volume of incremental production achieved. This approach has delivered a three-month long well stimulation project two years earlier than planned and could increase production by up to 40%. BP is looking to apply this model across more projects in the North Sea and plans to continue collaborative working with the supply chain to maximise recovery from their assets. A video of the Bruce field entry. The 2016 award winners were announced at The Oil & Gas UK Awards, at Aberdeen’s Exhibition and Conference Centre, on Thursday 3 November 2016. The two winners were the Southern Wye Project team and the ETAP Partners. The other two finalists were Late Life Management of Forties, and the Central Area Transmission System. From March through June, ConocoPhillips, Repsol Sinopec, Maersk, Ithaca and JV partners, in conjunction with key suppliers across the supply chain, successfully collaborated and safely executed a fast-track and complex subsea tie-in project, known as the Southern Wye Project. Particularly close cooperation was required between the Greater Ekofisk area operations in Norway and those in the UK. Collective value was maximised over individual positions (MER UK) whilst Judy/Ekofisk/Fulmar production risks were mitigated. Speed of response was essential to exploit the disconnection of the Janice field and tie-in of the Stella development during the 3-yearly Norpipe turnaround. This was an extremely busy and important shutdown period for the Greater Ekofisk area. The solution was only identified early in 2016; the project was achieved by all parties overcoming commercial, legal and logistical challenges with support from the OGA. The commercial behaviours demonstrated during the project show an embracing of MER UK - that overall value can be increased through collaboration. There was recognition that value for certain parties would be increased, whilst for others it remained unchanged. For example, there was significant risk that the production restart of fields could be delayed. Accordingly, Ithaca accepted the contractual right for the project to be terminated if the risk of delayed field start-up looked likely. The approach adopted during the Southern Wye Project is transferable across the industry. Increasingly we are seeing a regional approach to problem solving across the value chain. Opportunities to carry out collaborative work – in this case disconnection of one field and the connection of another during a period of summer maintenance – should lend themselves to the concept of a cross-company steering committee staffed by senior experts. The ETAP area owners (BP, Shell, Esso, JX Nippon & Zennor) have rewritten a number of key commercial agreements to improve alignment across all parties and create a sustainable framework to stimulate investment in both the ETAP Central Processing Facility (CPF) and a number of the associated fields. By realigning the ownership interests, associated decision making, and cost sharing mechanisms to reflect the remaining value in the fields, the ETAP owners removed the commercial misalignment that threatened investment in both life extension and increased value recovery activities. Tangible work programmes, including a £215million facility renewal activity, have been agreed and executed since the Heads of Agreement were signed in July 2015. All ETAP owners recognised that to create a sustainable commercial framework to underpin investment decisions for improvements in plant performance and extensions in the lifespan of the ETAP CPF, there would have to be a significant change in how the platform’s annual costs of around £100million were shared between the fields. The materiality of the changes in cost sharing and the budget implications during 2015, when oil prices had fallen from previous year's highs of over $100/bbl, required strong support from the senior leadership in all of the companies involved. The new commercial agreements were signed in September 2016, and set the governance framework and cost sharing mechanisms for the remainder of the ETAP CPF’s life. The owners can now plan the 2017 work programme and budget with a focus on investing for the long-term future of ETAP. The approach has demonstrated that, whilst not without difficulty, recognising and then creating the right conditions with appropriate leadership support and behaviours can deliver commercial solutions that enable parties to unlock potential to the benefit of all, even in the most commercially complex areas. Apache has demonstrated through sustained operations within the Forties Field, the significant and lasting economic impact that is possible from long term commitment to mature assets. Apache initially redeveloped the Forties Echo area increasing total field production by 50%. Changes to field development strategy culminating in a drilling investment of more than £2.5Bn reversed production decline. By working closely and collaboratively with the supply chain in the UK, this large capital investment was efficiently put to use. Over 170 wells have been spud across all six platforms and drilling continues today. Since 2003, an additional 250 MMBO has been recovered, nearly twice the reserves foreseen at field acquisition. The improved recovery and steady production plateau has been delivered through investment in regular 3D seismic surveys and ground-breaking 4D analysis. Underpinning the drilling investment. Apache also committed to renew the field’s power generation, accommodation, modernised key rotating equipment, installed substantial water re-injection facilities, replaced key safety and control systems and reconfigured the oil export system to transform operating efficiency from 70% to over 90%. Substantial additional investment to increase drill slots and operational flexibility included installation of the Forties Alpha Satellite Platform, the first UK built platform in the CNS in 25 years. In 2016, the Aviat gas field was commissioned to Forties Alpha through a 23km subsea tie-back, delivering fuel gas and enabling field life extension greater than 20 years. Apache’s success came from an ethos that runs through the company – The Apache Way. This allows timely risk-based decisions to be made locally, as there is proven and active leadership ability at all levels. This approach is a readily transferable management innovation which could be applied to any operator or asset in the UKCS. The Central Area Transmission System (CATS) is a critical piece of UK infrastructure that serves over 30 producing fields in the Central North Sea and in 2015 delivered over 5 billion cubic metres of gas to UK markets. CATS consists of a riser platform (bridge linked to the North Everest platform), 400km gas pipeline and a gas reception and processing terminal in Teesside. Until the end of 2015, CATS was operated by BP. Antin Infrastructure Partners (Antin) has owned 99% of CATS since 17 December 2015, with CATS Management Limited the company that manages the asset on their behalf. Antin is a leading European private equity company focused on infrastructure investments. Infrastructure investors are relatively new to the UK but they have been identified in the Wood Report as a potential source of capital with new ideas and new ways of working that can help to support a sustainable future for the UK North Sea. Antin has invested in CATS to unlock its full potential, and we believe we are bringing a different approach by putting an infrastructure asset at the core of our business. Having midstream assets in the hands of dedicated midstream owners is positive for the UKCS and is supporting MER primarily by securing long term availability of critical infrastructure and maximising throughput from all sources of gas. Antin introduced a novel operating model for the CATS System, focused on long-term strategic relationships where all partners are incentivised to deliver a successful CATS business. Maximising economic recovery in the Central North Sea is underpinned by the safe, reliable and efficient operation of CATS and by getting the most out of the eleven offshore processing hubs (9 existing and 2 in development). Over the last 12 months, CATS has executed new transportation and processing agreements for Culzean, Caley and Shaw, and amended terms with Stella to support a revised start-up schedule. The ECITB Offshore Project Management Steering Group (OPMSG) was set-up in January 2014. The OPMSG delivered a ‘not for profit’ conference in November 2015 focussing on Collaboration for Cost Reduction in delivering North Sea Projects. Feedback from the event highlighted key areas of concerns with MER including Stakeholder Collaboration; this resulted in the OPMSG agreeing to deliver a ‘Project Collaboration Toolkit’. A practical aid which sets out the behaviours required to achieve greater collaboration across the Industry. The final product is a hard copy guide and interactive online tool. The on-line tool is available to anyone, free of charge and includes an editable tracker with phase review checklists to benchmark and measure collaborative progress. The Toolkit, from concept to completion, took four months and initial feedback is overwhelmingly positive, and the desire to adopt, apply and embed this best practice into the right projects is already being made clear, including commitment from Aker Solutions to embed the practices of the toolkit within the hook-up of Statoil’s Mariner Project. Metron was set up in 2014 with a determination to help their clients maximise economic recovery by focusing on operational efficiency. Metron recognised that a key threat to MER is aging assets being considered for COP because the operator cannot maintain and support existing equipment effectively. With the maturity of the UKCS and current market conditions, it is often uneconomic to completely replace controls and instrumentation (C&I) infrastructure thereby increasing the likelihood of CoP. The C&I equipment on many platforms can be more than 40 years old. Metron have built a dedicated team of Engineer’s who are trained on these technologies and can act methodically to identify problems quickly offering economic solution. With this team, attitude, support infrastructure, in house training, belief and operational model Metron can, and have, already extended the life of offshore equipment. In addition they are prolific developers of appropriate new technology that help detect and analyse threats to downtime, increasing value to their clients. As an example, Metron worked closely with the operations team at a UK operator, helping to reposition one of their assets from imminent decommissioning back to a fully operating asset. This success has facilitated an estimated continued 10Kboepd being recovered. In addition Metron worked closely with another UK operator to successfully return a critical turbine to full operational following the failure of the control and protection system. The old system was repaired and a partial upgrade was achieved and fully commissioned within four weeks, something no other vendor has managed to achieve. They have also sourced, re-certified and continue to support obsolete systems avoiding a multi-million pound upgrade programme for a UK operator. VOR is the ‘Google’ of the energy supply chain and has given it users never seen before visibility of their supply chain. Designed to intelligently connect people, assets and big data, VOR has allowed its user base to drive new levels of efficiency and profitability. A single interface and dashboard allows proactive decision making by bringing data from multiple sources together and all in real time. The ability to understand utilisation, ensuring you are getting maximum value from your operations, is made clear using VOR. From uptime on tools and assets through to ensuring everything is repacked to prevent costly extended hires, this intelligent app has allowed teams to deal with what is important by automating the administration for them. In addition to this, users are able to track performance of their supply chain live. Safety and compliance is at the forefront of what we do in Oil & Gas. VOR’s ‘no compromise’ approach to how we manage risk in the energy industry, rewards complete transparency and the sharing of key operational documentation. From next service dates, to the full spectrum of certification which goes with equipment, VOR actively monitors this information to minimise unnecessary downtime of equipment and projects. This proactive, data driven approach to safety enables VOR powered users to address potential issues before they become a problem. Planning is key when it comes to operations. With VOR, planning asset requirements and logistics is modernised and simplified. From RFQ, through to deployment, VOR manages each process for you and if anything changes, the system will highlight both supplier and client instantly. VOR is built upon the foundations which Google has laid, allowing clients to leverage the multi-billion £ investment and power of Google’s global search technology. The result of this is access to next generation technology at a fraction of the cost. Coupled with the collective intelligence and operational efficiency of the modern energy supply chain, in real time, from your web browser. The latest update to VOR has enabled users to access the power of AMLA, the North Sea vessel sharing system and allows users to further increase their efficiency and reduce costs. Through a robust partnership and a move from traditional approaches BG Group (BG) and Stork worked closely to transform late life management execution. Successfully achieving positive results including increased efficiency and cost reduction contributing directly to Maximising Economic Recovery. Since 2014, BG and Stork have effectively delivered four flotel campaigns aiming to achieve a zero safety critical un-deferred integrity backlog. Within 12 months, the integrity backlog was successfully reduced from 51,000 hours to zero. Through strong leadership, engagement and lessons learned, operational delivery has now been fine-tuned and routine tasks further developed, driving AIR as part of scheduled maintenance programmes. BG and Stork firmly believe integrity led inspection combined with FM anomaly management can be successfully transferred across the industry transforming late life management in the UKCS. Furthermore, due to the success of the contract and new methodologies, Stork has liaised closely with existing clients and industry bodies to explain how it is imperative for Operators to start planning assets’ lifecycle from late life through to decommissioning. Brent has been an iconic field in the UK oil and gas industry. After 40 years of service the field has moved into the final part of its lifecycle, decommissioning. While preparations for decommissioning are at different stages across the four platforms, with some already having reached cessation of production (CoP), Brent Charlie is still operating as a producing Asset. Outline and release wells for P&L (getting checked out by the doctor). Reducing the risk around long term shut in wells and preparation for abandonment has the potential to generate tens of millions of pounds in up front savings. Maintenance/Integrity scope reduction (managing diet/lifestyle). Wells that no longer flow hydrocarbons require reduced well/preventative maintenance routines. Alignment of our well failure model allows the removal of unnecessary redundancy including well integrity test/subsurface integrity test scope, valve repairs and maintenance activities. What has this delivered? The realisation that it is possible to deliver concurrent P&L (9 wells) and WRFM activities (foam, retrofit gas lift, add/re-perforations) whilst improving efficiency in Opex expenditure. In fact, the success of the WRFM activities has effectively paid for the P&L activities to date. Improving our overall fitness and quality of life at no added cost. Reducing the cost and risks associated with ultra-late life production will help to sustain the basin in the short term and also provide an efficient route to decommissioning. The Integrated Brent Charlie Asset team has delivered a step-change in performance utilising a methodology that has been rolled out to other Shell operated Assets and is something Shell are also seeking to share as an industry best practice. Total’s Elgin/Franklin HTHP fields have undergone a three year redevelopment programme resulting in higher production and the promise of additional years of activity. In 2012 Elgin/Franklin ceased production following an incident that resulted in a gas leak. In the following year, Total and its partners worked to understand what had caused the incident, and subsequently it was decided to redevelop the fields including the drilling of new wells taking into account the complex subsurface environment of the field. Extensive drilling took place to both increase the understanding of the subsurface environment and to test new techniques and approaches. Total shared this knowledge with industry, both directly with the operators of other HPHT fields and more broadly in papers and presentations at industry conferences. In 2013 with the restart of Elgin /Franklin a further £1 billion was invested in the West Franklin (Phase II) project including the installation of two new Wellhead Platforms (West Franklin and Elgin B). Completed in early 2015, this project added a further 40,000+ boe/d to production. More recently in June 2016 this saw the new Elgin well EIC come online with daily production of 16,000 boe. As a result of Total and its partners determination to redevelop the Elgin/Franklin fields production in 2016 will exceed a rate of 140,000boe/d. This is higher than the level of production before 2012. The lessons learned on improved drilling will be transferred to other parts of their UK E&P activity, including the HP/HT Sween prospect in the Northern North Sea due to be spudded in late 2016. The redevelopment programme also adapted to the changes in the industry’s cost environment. For example in June 2015 Total’s Well Construction and Maintenance team saved £21.2m on its intervention to secure the Elgin G7 well by finding new ways to reduce the time it takes to abandon and plug such an HPHT well and also by re-examining the design of operation. Curlew, an ultra-late life facility, was purchased by Shell in 2013. To enhance the vessel, and avoid early decommissioning, the decision was taken to apply an alternative approach. Shell UK and STASCo (Shell Trading and Shipping) collectively compiled a recovery plan focusing on how they could reduce overall operational costs while increasing vessel reliability. By applying learnings from the STASCo shipping model to the FPSO, integrated teams across the asset were able to deliver challenging work scopes to tight deadlines ensuring the survival of Curlew and its continued and enhanced contribution to economic recovery of the UKCS. Significant changes were required to ways of working and behaviours. That journey began with a value adding back to basics review of core principles and processes including managing threats to availability, maintenance execution and integrated asset planning. Furthermore, in terms of behaviours, the introduction of STASCo engineers with a ‘fix don’t deviate’ mentality, as well as being multi skilled and able to perform tasks with little or no support from vendors, was a game changer. Thinking about how to approach tasks differently rather than ‘how it’s always been done’ became a cornerstone of the behavioural shift and really placed ownership and collaboration at the heart of Curlew’s revival. The impacts of these behavioural shifts were the development of a more engaged and motivated workforce to deliver results for Curlew and ensure its contribution to UKCS recovery, these shifts in mindset have resulted in several improvements. Three major factors to Curlew's success are strong leadership, cross team collaboration and employee engagement. A key learning from this project that can easily be replicated across other assets and the industry as a whole is the fact that these are not highly innovative or new techniques to leadership and engagement. In 2010, Chevron Upstream Europe (Chevron) moved away from the traditional “annual shutdown” approach to minimise the frequency (one every two years on its large manned facilities) and duration (under 30 days) of its Turnarounds (TARs) to help improve Production Efficiency. With the continued decline in oil price and increase in cost base, Chevron implemented a new vision and cultural tenets, focused on ‘Results, Accountability, Fit-for-Purpose and Trust and Empowerment’. Chevron’s TAR team has embraced these tenets and used them to lead a further step-change in TAR performance. By moving from a “schedule-driven” to a “scope-driven” approach, Chevron has implemented a Risk Based Work Selection process to better prioritise high-value tasks and critical work scopes that ensure safe, efficient and reliable operations. For example, in September 2015, Chevron completed a TAR involving the platform and floating storage unit of the Alba Field. The culmination of 18-months of planning, it involved essential maintenance work on both facilities, including the removal of 365 tonnes of sand from the polishing, coalescer and degasser vessels. With more than 13,000 man hours of maintenance and upgrade work scopes, the TAR was successfully executed in 22.5 days (4.5 days ahead of the P50 schedule), on budget and without any injuries or spills to sea. The impact to Chevron’s production was equivalent to approximately 80,000 barrels of oil equivalent. Building on this success, Chevron turned their attention to the Captain Field, successfully executing this year’s TAR, involving more than 9,000 man hours of maintenance, in 18.5 days (5.5 days ahead of the P50 schedule) – on budget and without any injuries or spills to sea. Over the last few years, representatives from Chevron (including its TAR team) have participated in a range of industry taskforces and work groups to share lessons learned and best practice relating to TAR performance such as Oil & Gas UK’s Production Efficiency Task Force and Turnarounds on Time Workgroup. Chevron has also regularly shared information and best practice at external conferences including; the ‘Turnaround Industry Network Conference’; and the ‘Offshore Shutdowns and Turnarounds Conference’. In 2013, Wood Group began a radical transformation of its business by focusing on three areas simultaneously- innovation, service transformation and day-to-day fixes. Wood Group set up a programme of transformational change called Xtend. The programme has had an unprecedented response- Xtend currently has seven active projects and a hopper of twenty more shortlisted ideas, all grass root suggestions from over 250 employees enrolled in the Xtend community. A multi-disciplinary group of 60-80 employees from this community plays a direct role in delivering the projects. Examples from the Xtend portfolio include a completely overhauled approach to delivering full-cycle repair orders and a dynamic, simplified and cheaper approach to engineering modifications both of which have received positive customer testimonials. Wood Group is committed to sharing its insights and improvements with other key stakeholders: customers, contractors, suppliers and the wider industry through Oil & Gas UK’s Efficiency Exchange (REE). Since April 2016, Wood Group has shared five success stories about its own improvements through the REE portal. It is now an established process to publish all relevant successes in this way and is generating new business for us. The MER UK Awards were presented for the first time in 2015. They recognised four deserving winners in Nexen Petroleum UK Ltd; the Northern North Sea Operational Gas Group (TAQA, CNR International (U.K.) Limited, EnQuest, Dana Petroleum, Fairfield Energy, BP, Shell UK and Esso); Centrica; and Total E&P UK and DONG Energy. Inspired by an innovative technique developed by the IT industry in Silicon Valley, Centrica pioneered the Hackathon in its UK oil and gas operations to improve the viability of projects, unlock value and increase efficiency. Centrica’s hackathon team worked with more than 70 contractors to break down supply chain barriers and create a spirit of collaboration. With average project savings of around 30 per cent, this creative approach enabled Centrica to proceed with two previously unviable projects. The concept is now being used by others in the industry, including the Technology Leadership Board. Changing behaviours and improving performance, Nexen’s goal is to become a best-in-class operator. Taking inspiration from the British Olympic Cycling Team, routine tasks were broken down to find small efficiencies which accumulated into significant benefits and savings. Onshore and offshore teams worked together to drive improvements and deliver impressive results, including a 30 per cent increase in off shore productivity in 2015. In addition, a significant reduction in wellhead maintenance shut-in times delivered an additional 140,000 barrels of in-year production. Nexen is now sharing its ground-breaking approach with other operators and service companies. The companies involved in the Northern North Sea Operational Gas Group looked beyond their own operations to see the bigger picture. Regional analysis highlighted the opportunity to share fuel gas and overcome a shortage in some areas of the Northern North Sea. Under the leadership of TAQA’s Pete Jones, several companies formed the Operational Gas Group, combining joint requirements to create scale and agree new commercial terms with suppliers. This great example highlights the commercial and operational benefits of companies working together to achieve a common goal; and establishes a positive precedent for others to follow. Recognising the risk of Edradour and Glenlivet becoming stranded discoveries, TOTAL and DONG abandoned conventional commercial agreements to create an innovative approach that maximised overall value for both companies. They adopted a value-sharing approach which resulted in the joint development of the fields, with estimated total production of 65 million barrels of oil equivalent over the life of the fields. TOTAL and DONG applied a regional approach which enabled them to remove barriers and focus on maximising economic recovery.